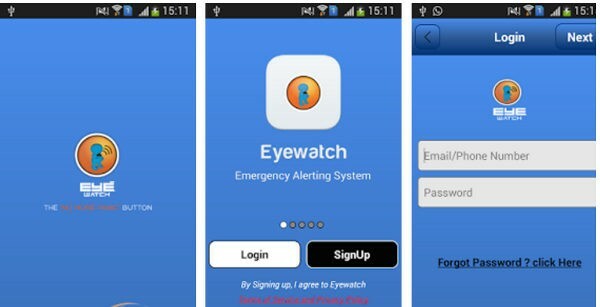 Eyewatch Police Android App is a revolutionary personal safety system, which leverages on the power of current generation of smart phones and cloud based computing to provide a convenient and efficient mode of communication in an emergency situations. The same was launched by the Commissioner of Police Belagavi today. The app alerts police and medical assistance about the distressed user along with his or her geographic location either through GPS or mobile-internet network. The app is also equipped with system to send SOS alerts even if the user is not connected through GPS. and to the user’s call guardians. App is recording Pre audio and video for the User safety in case of an emergency , if he/she does not want it , they can disabled it from App settings. 2. Audio recording before the alert was activated. 3. Video stream are automatically captured. 4. Periodic location tracking, after activating the alert. 2. The only known system to record periodically audio data before alert activation. 3. Uses secure cloud based infrastructure to provide reliable service. 4. Audited and certified by independent security experts- Safe and Secure to use. SOS BUTTON: One touch alert to notify the Police & user’s call guardians via SMS and E-mails. LOCATION & LIVE TRACKING: Instantly notifies the police & user’s call guardians with his/her current location & allow them to track the user until he/she reaches a safe destination. AUDIO VISUAL STREAM :Eyewatch automatically records a 20 second pre-alert audio stream, and a post alert 20 second video stream to be viewed by Call guardians on a secure webpage. AUTO CALL CONNECT: Instantly dials the Police control room & thereafter the call guardians if the call to the police is not answered or disconnected. CRITICAL PHONE DETAILS: Records user’s live battery and network signal strength, this is displayed on the Eyewatch Police control center. ALERT VIEW: Tracks and displays user’s location on a map, displays audio video feeds, network Signal strength & battery details and other relevant information on a secure webpage. SAFETY CONFIRM: Informs user’s preset contacts with user’s location to confirm he is safe.